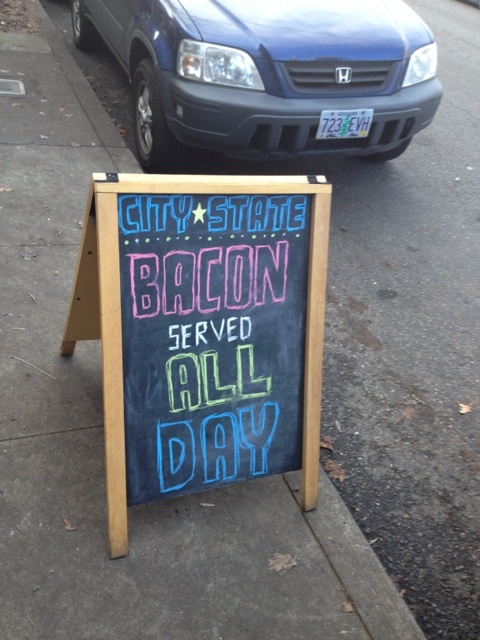 The other day, a friend and I had breakfast at City State Diner on NE 28th. I’ve only discovered them in the last couple of months, and in my opinion they have the best biscuits and gravy in Portland. Hell yeah! So anyway, I ordered the biscuits and gravy, and asked for my eggs to be over easy. Our waiter asked if I wanted grits or potatoes. Hmm, I’m not usually a big grits fan but… sure, grits, why not. He vanishes, I enjoy strong black coffee and chat with my pal. A cook comes from the kitchen and delivers our plates, and I do a double-take. What?! What was delivered were two triangular slabs of dense corn meal cake, about an inch thick, with a slight sear on it. That’s not corn meal, that’s polenta! I wasn’t upset, I like polenta, but I was more than a little bewildered. In a couple of minutes, the waiter stopped by to ask if everything was okay. I said, “I’m not upset, and I don’t want to send anything back, but… are these really grits? Because I’d sure as heck call this polenta.” My waiter immediately sounded apologetic. “Are you maybe from the South? ’cause I’m from Memphis, and yeah, there’s no way we would call that grits either.” I immediately broken into a grin. “No way, you’re from Memphis, too?! What high school?” We swapped pedigrees and exchanged a terrorist fist bump over having escaped from Memphis. I then told him to prepare to be green with envy, because my old man had sent me real, honest-to-goodness pulled-pork barbecue from Memphis for Xmas. I said, “You know, I like Russell Street BBQ well enough, but really nothing quite compares to real Memphis barbecue.” His ears perked up. “What? Portland has barbecue? Where? What’s the name again?” So I got to clue him into a local BBQ joint, which made me happy.